Naismith Memorial Basketball Hall of Fame, Women's Basketball Coaches Association Narrow Watch List for 2018 Nancy Lieberman Award — Position Sports, Inc. The Selection Committee for the Nancy Lieberman Award is composed of top women’s college basketball personnel including media members, head coaches, sports information directors and Hall of Famers. In March, five finalists will be presented to Ms. Lieberman and the Hall of Fame’s selection committee. Fans will also have the opportunity to vote for their favorite finalists to determine the Naismith Starting 5 at www.hoophallawards.com. The winner of the 2018 Nancy Lieberman Point Guard Award will be announced during ESPN2’s telecast of the national semifinal games in the 2018 NCAA Women’s Final Four in Columbus, Ohio on Friday, March 30. Additional awards being presented include the Ann Meyers Drysdale Shooting Guard Award, the Cheryl Miller Small Forward Award, the Katrina McClain Power Forward Award and the Lisa Leslie Center Award, as well as the Wade Trophy, the sport’s oldest and most prestigious national player of the year award which is presented annually by the WBCA’s community of coaches to the best player in college women’s basketball. 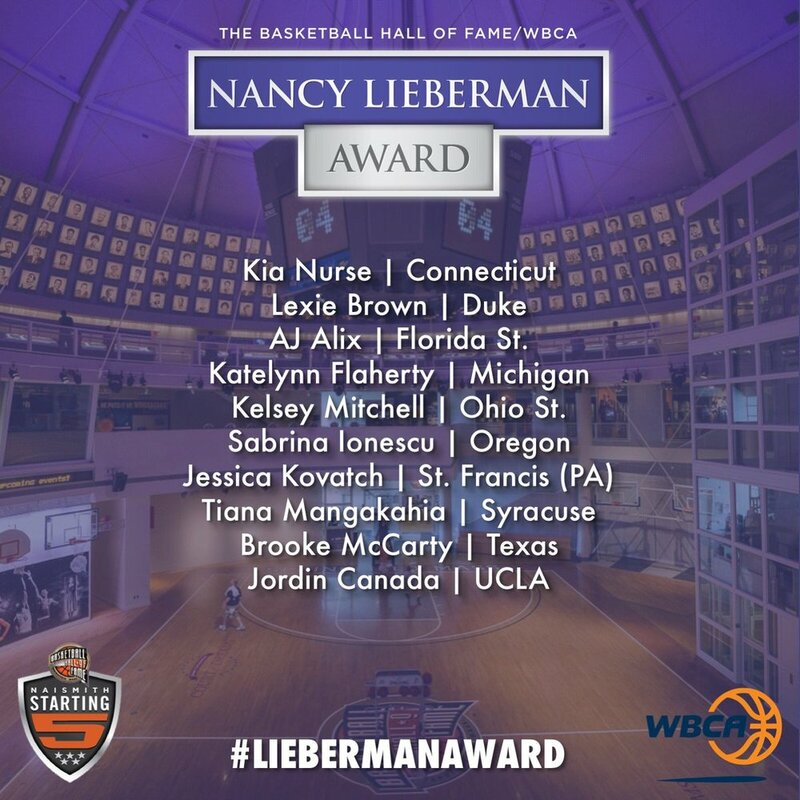 Previous winners of the Nancy Lieberman Award include Kelsey Plum, Washington (2017), MoriahJefferson, Connecticut (2015-16), Odyssey Sims, Baylor (2014), Skylar Diggins, Notre Dame (2012-13), Courtney Vandersloot, Gonzaga (2011), Andrea Riley, Oklahoma State (2010), ReneeMontgomery, Connecticut (2009), Kristi Toliver, Maryland (2008), Lindsey Harding, Duke (2007), Ivory Latta, North Carolina (2006), Temeka Johnson, LSU (2005), Diana Taurasi, Connecticut (2003-04), and Sue Bird, Connecticut (2000-02). AJ Alix - Florida St.